With the age of darkness over Zahnia went north and founded the city of Calderia, the home of the mages. The people loved him and proclaimed him King. Zahnia’s reign lasted for forty years and peace and prosperity came to the world. Massive new cities were built, roads, bridges and trade flourished once more. In the south massive reserves of gold were discovered bringing in a true golden age. The Golden Hills provided all of the gold for Esperia in this time and the wealth created allowed the creation of the Golden Empire. Entire cities were constructed out of the precious metal and mighty castles sprung up around the land. In gratitude of the role they played in Danon’s second fall the people anointed mages as their lords and their power and influence increased until some were granted the title of lower Kings. Sat on his throne of Gold was Zahnia who proclaimed the age of Gold as begun. A new epoch began that day and for nine hundred years peace ruled. Art, science, music, all prospered in the early centuries of the Golden Empire. Wonders of the world were built all over Esperia. The mighty golden statue of Zahnia was built into the side of the Mountains of Eclin. (long since lost to plundering thieves) The Great cathedral of Niveren was built in Sunguard and 48 wizard towers were constructed across the various continents of the world. The Wizard Lords were just and ruled well using their power to help the people and safeguard the world from evil. As time passed the wizards grew in power. The Emperor of the Empire was struggling to control the vastness of his glorious realm and so he made the most powerful wizards Kings to rule as they saw fit over the far reaches of the Empire. As the Clerics teach however all power corrupts and so it was with the wizard kings. Some grew jealous of their rivals lands and conflicts between the wizards grew common. With their magic the wizard kings had the power to topple cities. In the continent of Yundol, the empire fragmented as dozens of wizards battled one another for supremacy. The emperor was powerless to stop it. As the years passed, more and more territory slipped away from the Empire’s control as the common folk rebelled against the tyranny of the wizard kings. Eventually the people grew tired of the wizards and their abuses. A group of warriors calling themselves the Free Fighters was formed and within a year rebellion had erupted right across the Empire. Battles between the Golden Empires armies and the Free Fighters became common place. Massacres and atrocities became common place and the heart of it all was the advisor to the Empress Theodora. Sivion the magistrate was secretly the head of the resurgent N’gist cult. His corrupt teachings had spread amongst the wizards and mages of the Empire. The N’gist used their dark powers to crush the rebels and raise the dead. Millions perished in the bloodletting. One thing Sivion and his followers had not realised however was that their secret was known by a wizard known as RavenGuard. The wizard hastened west to the Great Plains where he sought out the aid of the nomadic Delfin tribe. Sivion had abducted the princes of the tribe in hopes to sacrifice her to his master, Danon who he intended to free from the void. 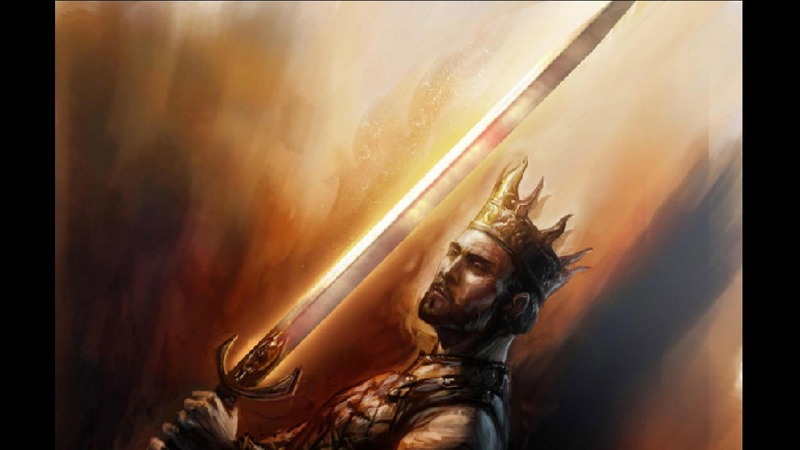 The King of the Delfin refused to aid the wizard but his son the Prince Markus took up his sword. With ten companions Markus embarked on a quest to save his sister. The Ten Champions as they were known infiltrated the Empire, snuck into Sunguard and freed the princess Ria and Empress Theodora. It was here that Markus met Theodora and a love that would echo down the ages was forged, it was in the royal palace too that Markus found Asphodel. Unfortunately for the prince he had been promised to another, the daughter of the Delfin tribes arch rival the King of the Stormchaser clan. The Ten battled the forces of Sivion before fleeing back to their homeland. They returned to find their home besieged by the Stormchaser’s who were outraged upon discovering Marcus’s betrayal. Knowledge given to them by Sivion. In the battle that followed the Delfin tribe won the day but the King was slain. Markus was proclaimed King. His vengeance saw the Delfin tribe subjugate the other tribes. With a vast host at his back Markus turned his attentions back to the Golden Empire which was now under the sole dominion of Sivion. What was left of the Free Fighters fled to join Markus. Mages arrayed against Sivion also swelled his ranks. With an army of close to a million men King Markus invaded the Empire. Several battles were fought and won until finally his army laid siege to Sunguard. There on the last days of the siege Sivion and his wicked followers cast dark magic which transformed him into a Lich. With his new powers Sivion laid waste to the Delfin army. Defeat was almost nigh when Markus, wielding Asphodel cut down Sivion. With the dark wizard’s death his forces collapsed, his un-dead abominations fleeing north to cower in the darkness of the Eclin Mountains. The Empire was toppled, and Markus had conquered his enemies. With the fall of the Golden Empire the last great empire of the Nivion folk fell. Markus was not to enjoy his victory for long. In an act worthy of the great tragedies, Marcus was murdered by the jilted princess of the Stormchaser clan. At a feast in his new capital the princess Yissa had arranged for the king to be killed. The feast hall doors were sealed. Hiding in the rafters of the hall were the assassins of the Crimson Blades. No one in the feasting hall survived. Including the Empress turned Queen Theodara.